A husband and wife author team the Gears are perhaps best known for their People series (People of the Wolf, People of the Lakes, to name a few), which is also called The First North Americans series. Both archeologists, all of their novels reflect a deep dedication to preserving the numerous cultures of different Native American tribes. They also have a knack for creating amazing characters that truly jump off the page to life. Coming of the Storm is the first novel in a trilogy. 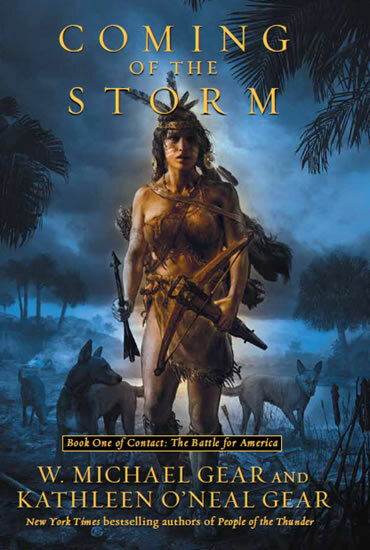 Unlike the People books, which can be read in any order and each stand alone, the Contact: The Battle for America should be read in order, starting with this novel. This series explores the culture clash during the years following Spanish explorer Hernado de Soto’s 1539 landing in Florida. Black Shell, an exiled Chickasaw trader, is initially fascinated by the pale strangers. Despite warnings from a beautiful and clever woman named Pearl Hand, Black Shell doesn’t realize the danger these newcomers present to his people and their way of life until he experiences their forceful ways himself. Together with Pearl Hand, he must find a way to unify scattered and opposing tribes before it’s too late. I really admire the seemingly effortless way the Gears fold an amazing amount of cultural detail and world building into an exciting, tightly-paced adventure. Their characters, especially Pearl Hand, are well-rounded and fascinating every time. What I enjoyed most about this trilogy is that I got to spend more time with these characters, instead of just a single volume. You can’t help but cheer for them as they try to overcome enemies from both within their borders and across the sea. Personally, I think this is some of their best novels yet!